Over the years there are many things I’ve come to associate with summer: heat waves, crowded beaches, Ninja Turtles Ice Cream, and a traveling music festival that makes its last stop across the street from my house. After doing a quick check with the press coordinators, Amanda and I began walking over to the inflatable schedule for the day. 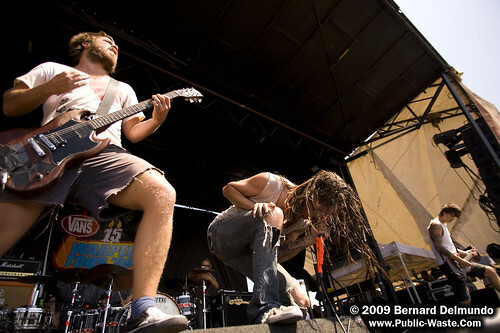 I immediately had to break off and run as I heard Underoath already on stage and opening up the day’s festivities. I’ve seen these guys countless of times before and every time is never a disappointment. 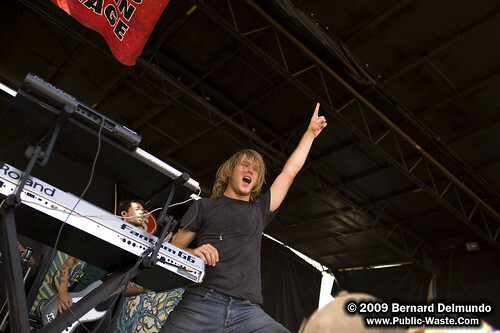 Despite being first band of the day on the main stage, their energy was high and continued throughout their set. 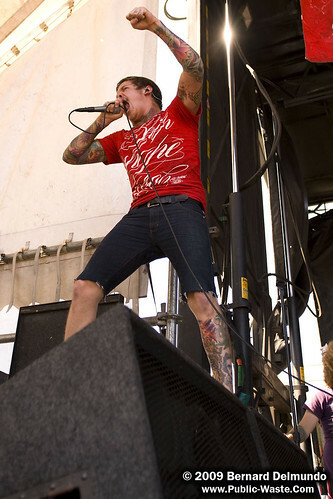 The many loyal fans who waited in line long before doors to the venue opened were treated with a strong musical performance by one of Warped Tour’s main stage all-stars. 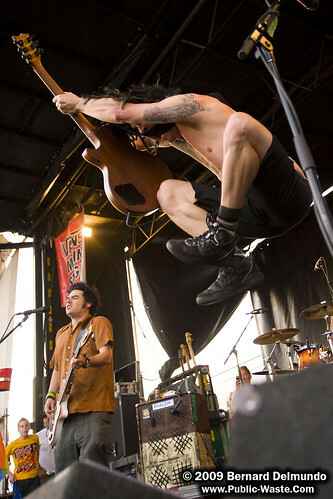 Not only was their playing spot-on, but their overall stage presence was highly entertaining. 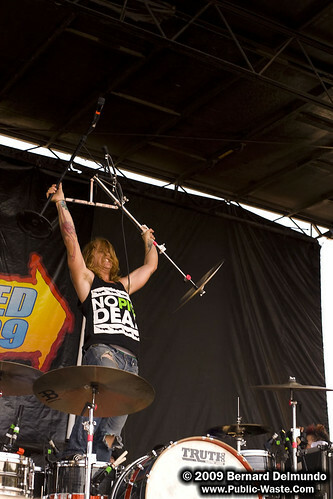 Between frontman Spencer Chamberlain standing on the barrier to get face-to-face with fans and drummer Aaron Gillespie freaking out and throwing down parts of his drum set, it can definitely be said that Underoath started the day off with a bang. We walked around for a bit and ran into the Offical Pit Reporter, Tiffany Mink (better known as Minkus). 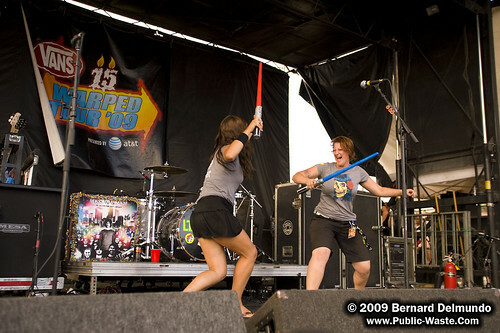 She was really nice and told me she was taking her last day to be a fan: no work, no meetings, no catering tent, and enjoying Warped Tour the same way she normally would. Cool girl, looking forward to what goes on with her in the future. 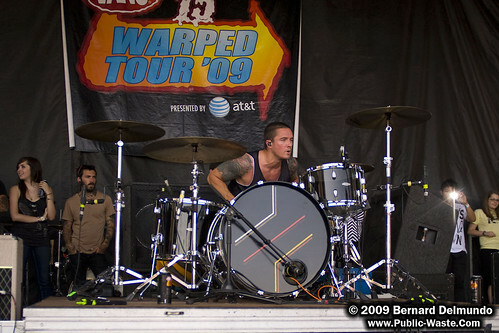 Up next for me was Saosin. This band based just down the road in Newport Beach is another one of those bands that I’ve seen quite a few times before. 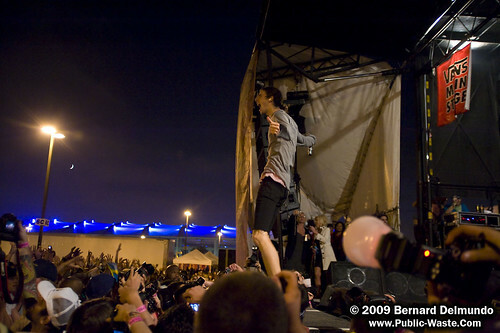 Fans were definitely excited to see this band. 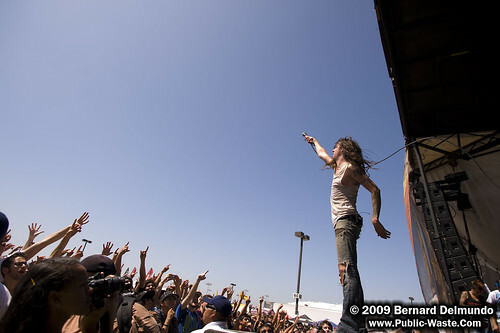 The start of each song was met with screams of approval and the audience singing every word. 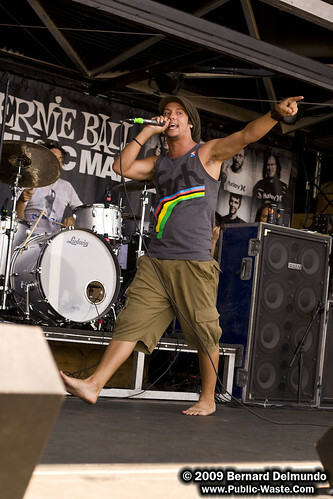 I have to be honest and say that this probably wasn’t frontman Cove Reber’s best performance. 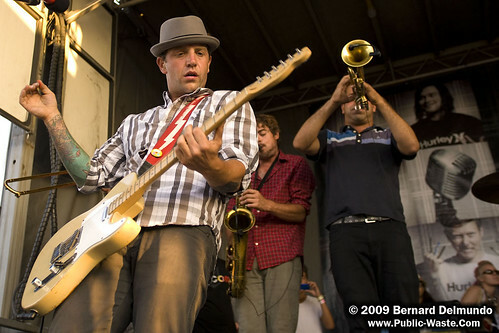 He struggled to hit notes and often paced around the back of the stage in front of drummer Alex Rodriguez while the rest of the band took care of the more prominent areas at the front of the stage. 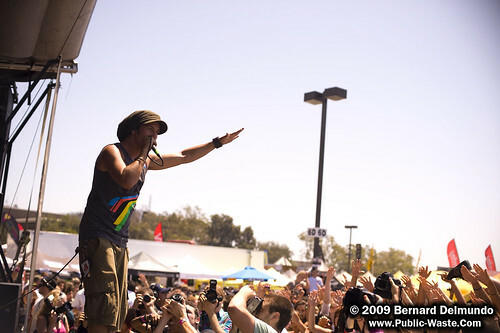 Reber began to warm up to the crowd, however, and stepped into the sunlight for those in attendance as the set went on. 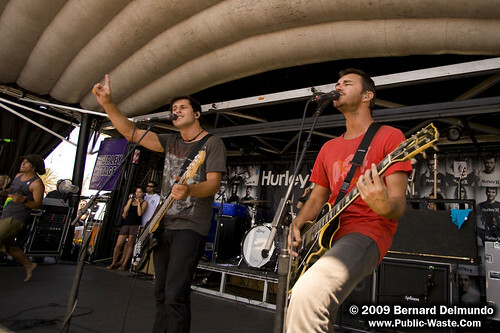 In support of their new album, In Search of Solid Ground, Saosin performed new songs as well as old for another good performance. 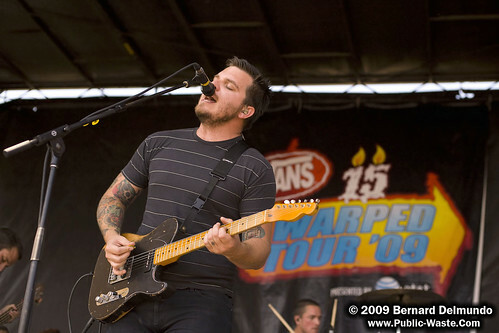 Also hailing from Southern California was the fan favorite, Thrice. 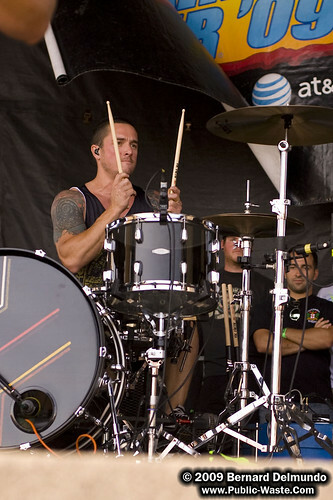 Go to any message board and you’ll see the frustration from fans who did not get to see Thrice during Warped Tour. 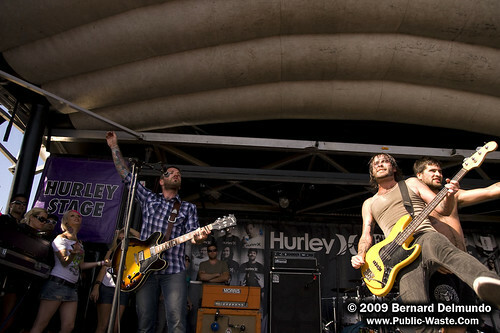 I feel really fortunate that I not only got to see these guys perform, but I got to document the performance as well. 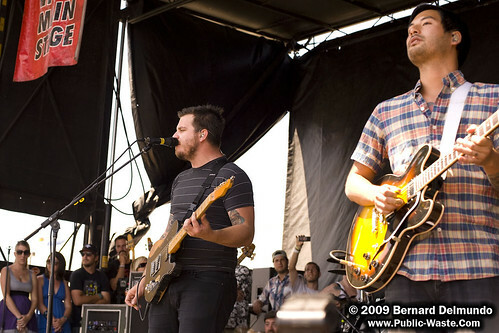 I’ve seen Thrice more times than I’ve seen any other band (their good friends Brand New come in a close second), and every performance is amazing. Watching this band grow musically over the years has been great. 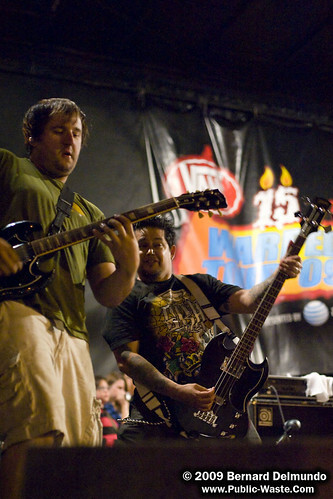 Their on-stage performance continues to evolve alongside their music and helps to capture the audience’s attention. 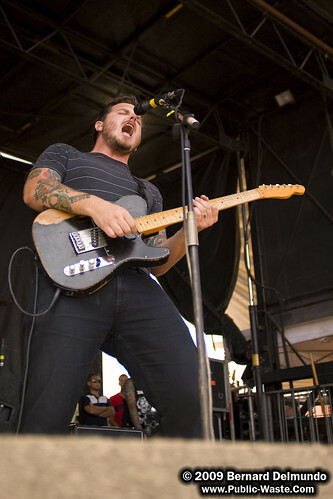 Fans needed no persuasion, however, as every word to every song was echoed back to frontman Dustin Kensrue. 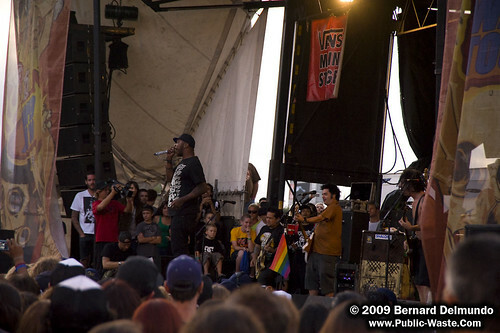 Songs from the new record Beggars (available digitally on iTunes, physical release on September 15th) went over well with the crowd. Whether the words were learned on an extremely early leak of the album or the digital release, it was great to hear fans singing along to and enjoying the new material. 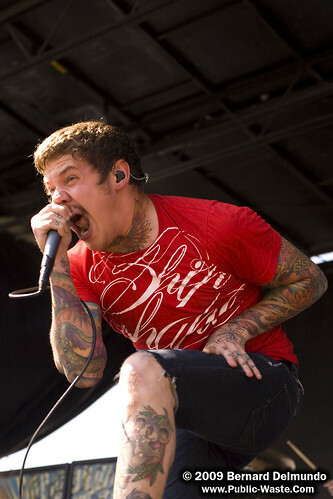 Older, heavier songs kept longtime fans happy while vocal harmonies and more technical musicianship on newer songs kept jaws dropped and eyes opened wide. This band continues to amaze me. Check them out on tour this Fall. I arrived late to Underoath’s American Siege Tour late last year and unforuntately missed the first few songs of The Devil Wears Prada. I wasn’t going to let that happen again. 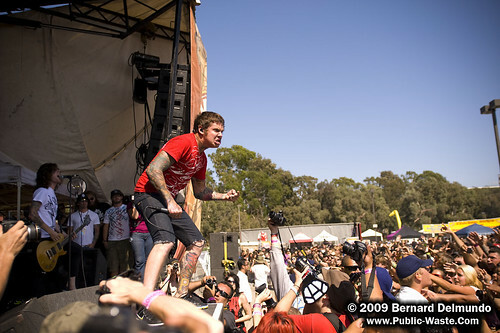 The Devil Wears Prada exploded on stage with heavy music accompanied by even more aggressive vocals. 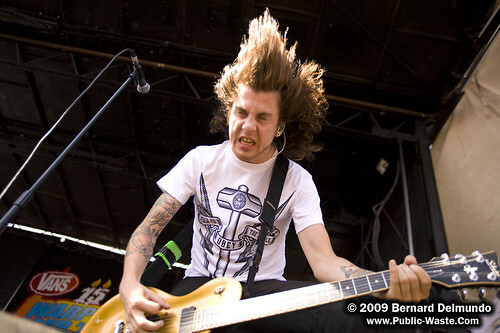 Mike Hranica is a very animated front man! Bouncing around all over the stage, screaming wide-eyed and looking fans in the face… definitely one of the best visual performances. 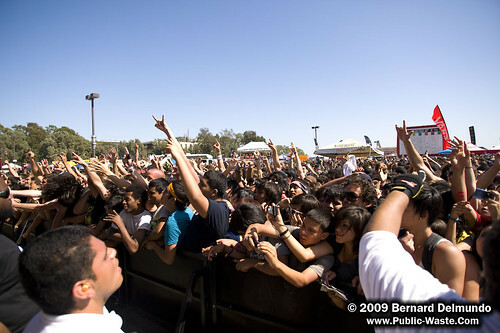 Fans responded well to the band by singing (and screaming) along to songs or crowd surfing from any and all directions. Security definitely had their hands full with this band! You want to talk about high-energy performances? 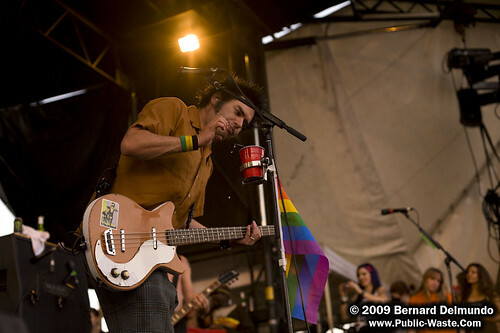 This band takes care of that with no problem. Head-banging, melting metal faces, and an off-the-wall frontman are staples of this band’s live show. 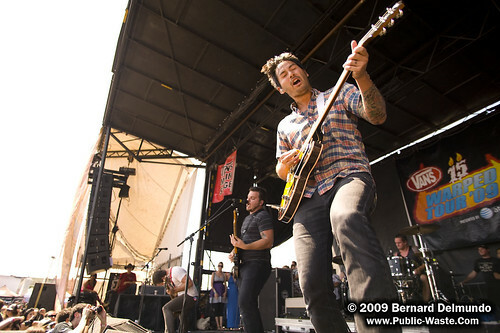 After The Devil Wears Prada’s insane performance, Amanda and I headed over to the press area to interview Thrice. It was good to slow things down and take a break from the heat. 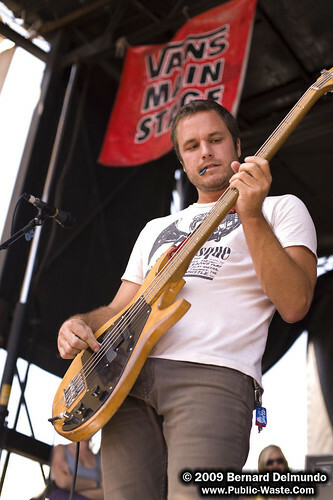 The band was split up with different reporters in attendance. I was happy to talk to anyone but we were graced with Teppei’s presence for our interview (actually Amanda jumped at Thrice’s tour manager when she saw Teppei was next to be assigned). CLICK HERE to read our interview with Teppei. 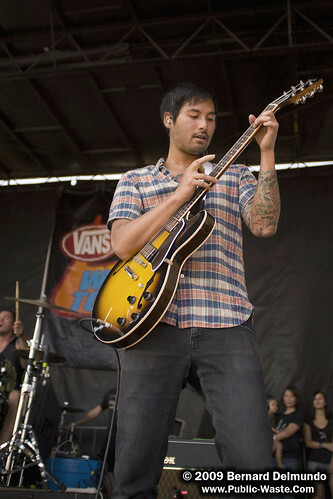 Following our interview with Teppei, it was time to get back into the musical swing of things. 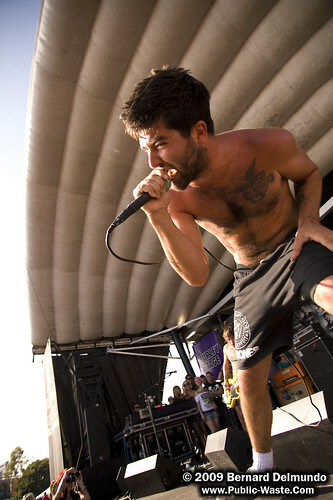 What better way than with Canadian rockers Alexisonfire? With a wild frontman like George Pettit and the melodic voice of guitarist Dallas Green, it’s hard not to stop and watch this band. 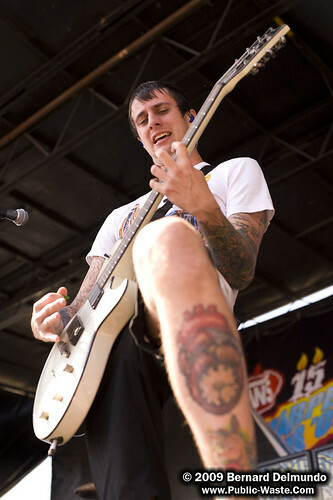 Pettit stomped around the stage with such a fierce energy that I expected him to start doing backflips while screaming! 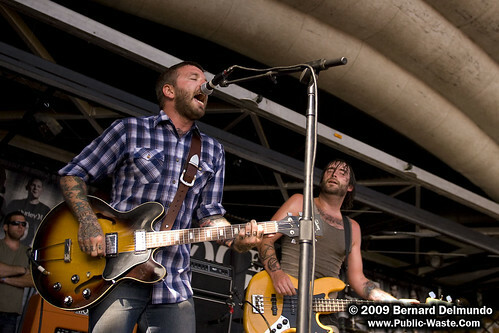 Fans enjoyed songs spanning Alexisonfire’s career and showed their appreciation by bouncing back screams or participating in infectious melodic choruses. 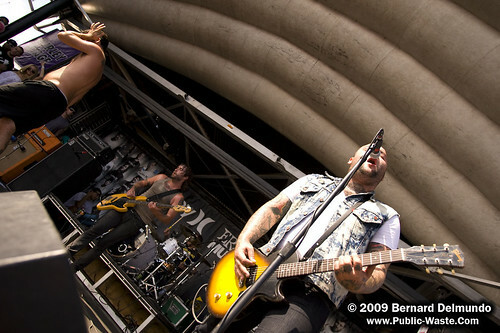 Alexisonfire’s music, supported by strong stage presence makes them a band to check out if they come around your area. 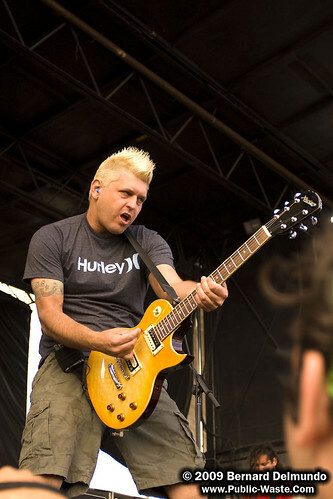 Up next was a band I’ve listened to since back in middle school, Less Than Jake. 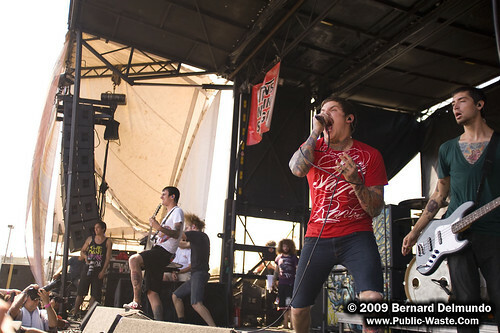 Out of all the Warped Tour performances, they were probably the most fun for me. 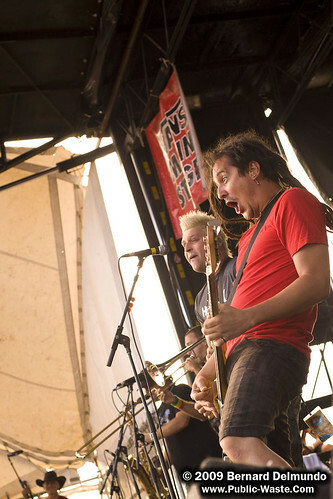 Less Than Jake’s upeat ska-punk evokes a carefree vibe from anyone in attendance, definitely fitting for a hot summer day. 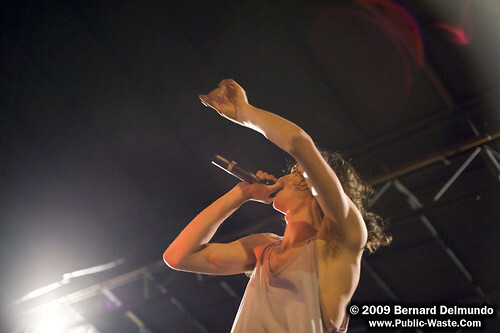 All throughout their set, there was something to really make their performance standout. 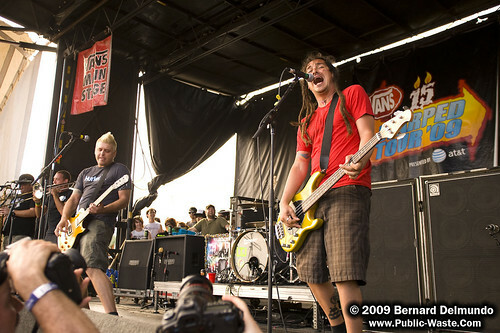 Besides Less Than Jake’s own stage presence, their antics really drew a crowd: A pre-performance lightsaber fight, a guest appearance by fellow ska band Streetlight Manifesto, busting a piñata on stage and throwing the candy-filled box into the crowd, bringing up fans that stood out in the crowd (the “mowhawk couple” and the man with the awesome mustache), and shooting the sun-drenched crowd with a Super Soaker. 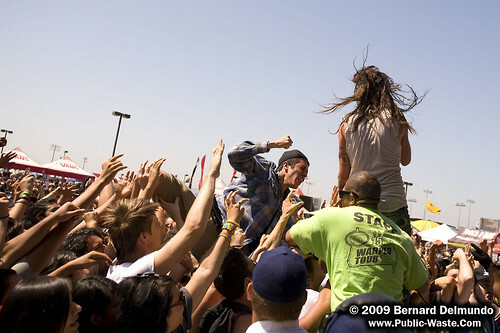 It was the attempted crowd surfing makeout session that put most cameras in the air, however. 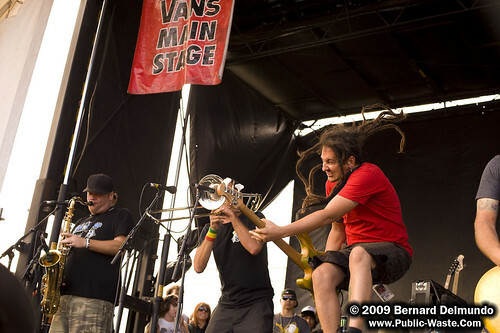 People using the parking lot lamp posts to get a better view of the band caught Less Than Jake’s attention. 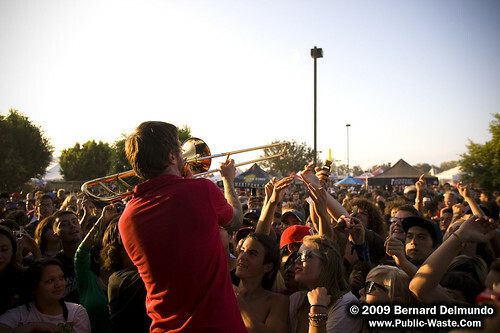 What started as a request for “the girl in the red shorts” to crowd surf from one lamp post to another resulted in the request for her and “the guy in the purple shirt” on the opposite lamp post to crowd surf and make out in the center. The band began playing, crowd suring was quick, but despite the band egging them on, the girl refused. 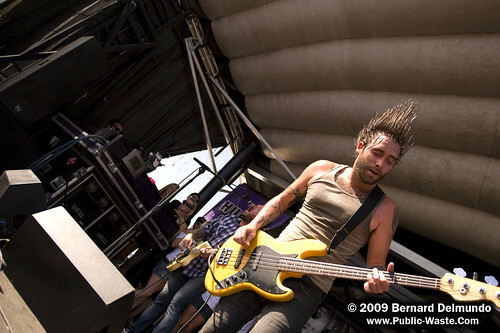 Thus, she was labeled by the band as having the worst breath at Warped Tour. The kid in the purple shirt came back saying, “she asked ‘How old are you?!'”. Upon hearing he was only 14 she quickly replied with, “Oh, hell no.” Fun stuff! More horns! 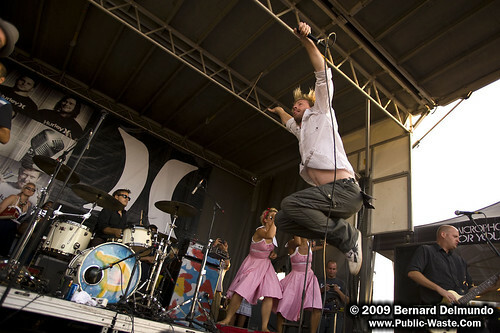 The ever entertaining Big D and the Kids Table hit the Hurley.com stage hard. With catchy, up-beat songs and a wild dancing singer in the form of David McWane, it’s easy to see why Big D and the Kids Table is so popular with their fans. 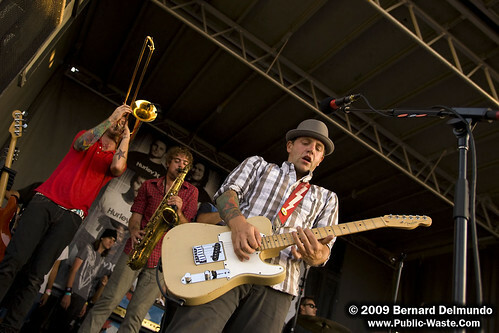 You can’t help but dance when you hear this band! Along with their normal line up, they also featured a couple of back-up singers complete with classic doo-wop attire. 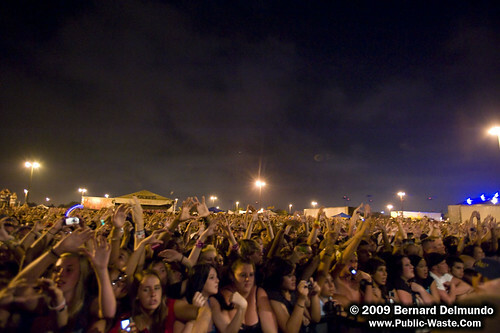 Aside from the fun music, Big D makes sure to take every second to put on a good show for the crowd. Whether jumping around on stage or stepping down from the stage to get up close and personal with the audience, this band put on a great performance that you would be sorry to miss. 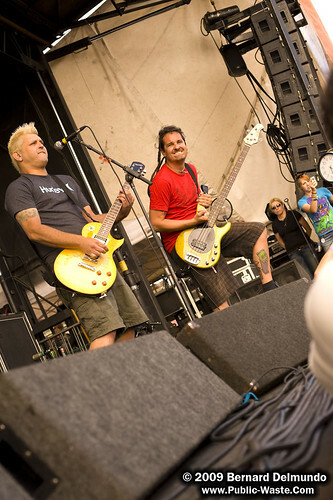 NOFX… What can I say about this band? Watching them is like a concert and live comedy show in one. 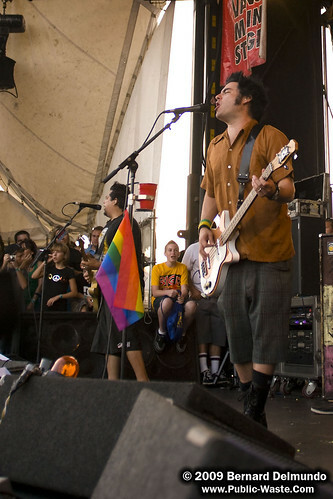 In Fat Mike’s own words, “Now that Bad Religion is off the tour, we are the best band on Warped Tour.” With so many albums under their belt and NOFX’s Warped Tour experience, you’re sure to hear them play a favorite during their 40 minute set. 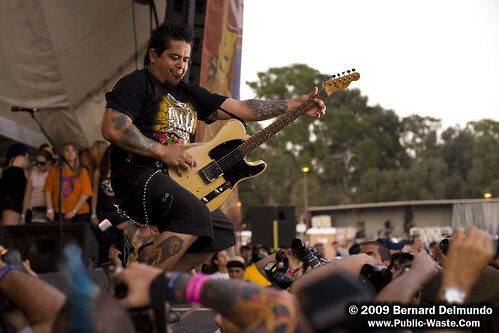 Fast tunes, circle pits, and Fat Mike taking sips of alcohol throughout the set all go hand-in-hand for this band… but so does playful banter and jokes! After hip-hop artist P.O.S. 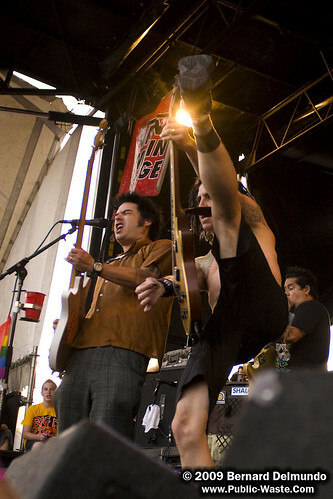 joined NOFX on stage for guest vocals, they joked about it being okay to now tell racist jokes. 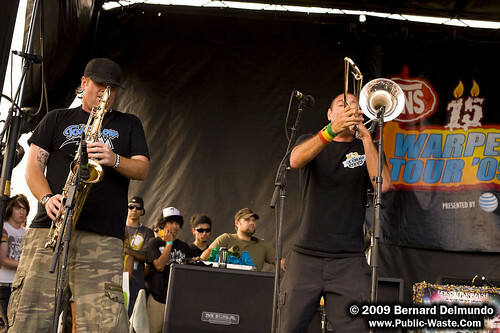 With El Hefe manning his trumpet, the band went into the joke-filled song “Arming the Proletariat With Potato Guns”. These guys are all-around performers so make sure you catch them live sometime! 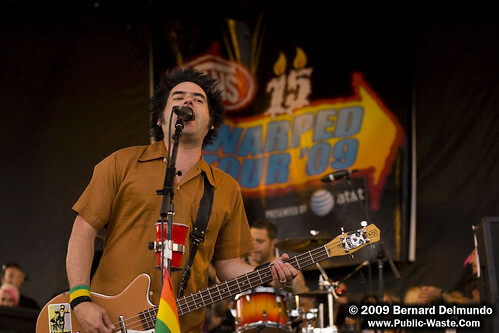 NOFX is known for trash talking on stage, but Fat Mike promoted the Warped Tour closers, 3OH!3, so that fans could catch El Hefe play bass for the Colorado duo and “earn his two tacos”. 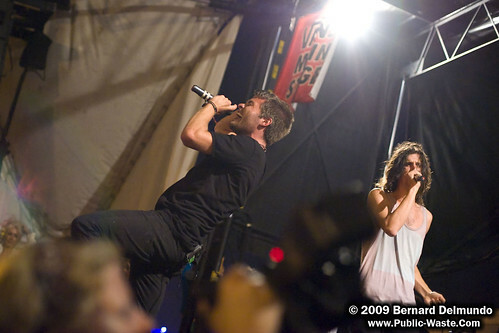 With radio hits and the growing electronica craze, 3OH!3 took to the stage to close out the last day of the Warped Tour’s 15th year on the road. 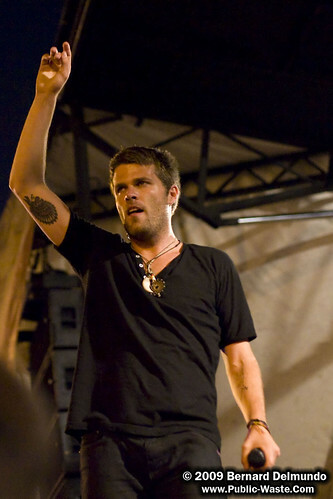 Even though there’s only 2 guys in the group, a full band was on hand to provide backing music for the live performance of 3OH!3’s songs. 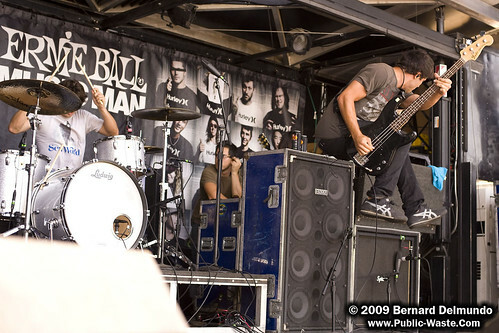 This allowed the duo to roam the stage for a high energy performance that would make marathon runners jealous. 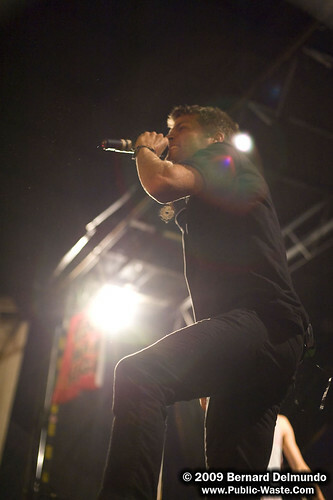 Even if you’re not into their music, you can’t deny that 3OH!3 put on a wild performance. 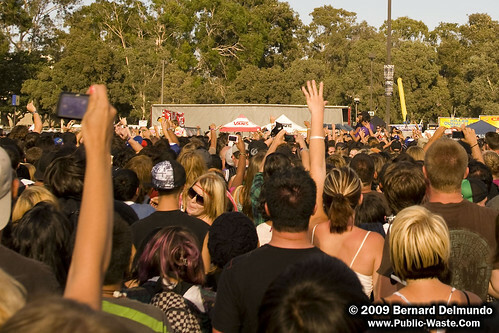 Judging by the crowd packed in to see them close out the tour, you can tell that a lot of kids went home happy. 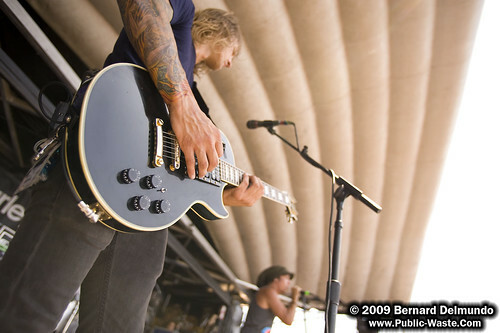 Warped Tour is aways changing with the times. 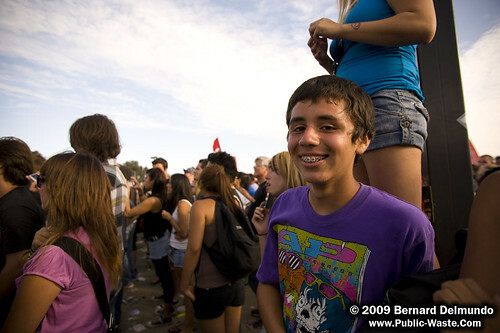 Regardless of what musical style is conquering the iPods of kids around the nation, Warped Tour never disappoints to have something for everyone. Besides the music, you meet and talk with like minded individuals whether they’re behind the table of a merch booth or sweating it out next to you in front of a stage. 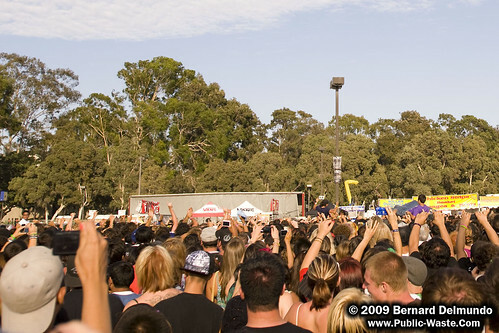 After 15 years strong, it’s definitely exciting to see what Warped Tour has coming up next. This post wouldn’t be possible or worth writing without the following people: Kristine Ashton and the rest of the MSO staff for another smooth press operation. Kevin Lyman and the Warped Tour staff for another great year of live music. Katy and Damon for arranging the Thrice interviews. The other photographers I met throughout the day. Rob from Skate 4 Cancer for being such a nice guy. Amanda and Liz for hanging out. 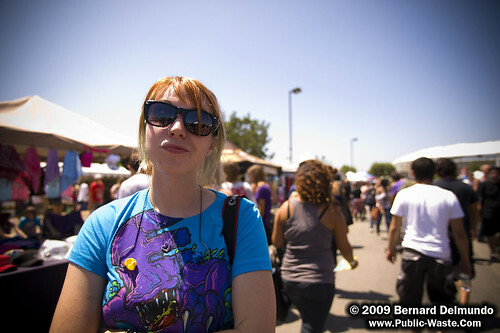 And all the people I met throughout the day for being so cool on such a hot day.